One such occipital combination, seen exclusively in men in my experience, is a lower occipital bulge at the inferior end of the skull bone. 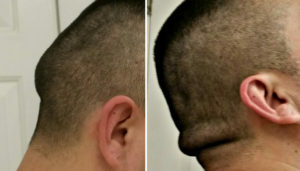 It consists of a bony protrusion caused by the combination of an occipital knob and prominent nuchal ridges. Laying over it is a thick horizontal scalp roll. In treating this particular occipital deformity both must be reduced to flatten the transition from the back of the head into the upper neck. The horizontal scalp roll excision was marked out in the awake upright postion with the head extended. Once under anesthesia and in the prone position, the predicted locations of the greater occipital nerves were marked. Then the full extent of the lower marked skin incision was made With a superiorly-based scalp flap elevated the center occipital bony knob was burred down turning the bone shape inward. One the bone was removed the superior scalp flap was raised to create mobility. In doing so the greater occipital neuromuscular bundle was identified and preserved laterally. 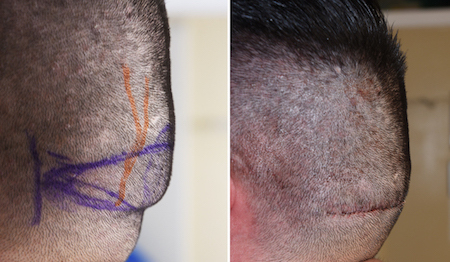 The scalp flap was the pulled down over the lower incision pilot cuts made and the redundant scalp tissue removed. Scalp closure was done in layers and no drain was used. The immediate result showed a complete elimination of the occipital bulges. Combining occipital knob skull reduction with overlying scalp roll excision provides the most complete flattening effect to the back of the head as is possible. 1) Some aesthetic occipital skull deformities have a combined bone and soft tissue component to them. 2) Lower end occipital bone and overlying scalp rolls can be treated through the same incisional approach. 3) Occipital scalp roll excision must take into consideration its thickness as well as the location of the greater occipital neuromuscular structures.